The human heart, created in the image of God, yearns for joy and fulfillment. Saint Benedict, at the very outset of his Rule for monasteries acknowledges this innate need when he asks with the psalmist, “Is there anyone who yearns for life and desires to see good days?” (Prologue:5). Where do we find this joy? As Christians, the source of our joy lies in the very life and beatitude of God who lives within us and loves us infinitely. “We have come to know and to believe in the love God has for us” (1 John 4:16). Even on the eve of his passion and death, Jesus affirmed his own gladness and his desire to share it with us: “that my joy may be yours and your joy may be complete” (John 15:11). True love, the turning from self to the other, compels us to find our happiness in the happiness of the one we love. 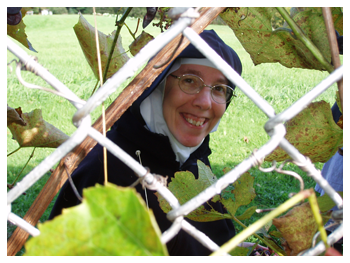 In the words of Mother Cécile Bruyère (first abbess of Sainte-Cécile of Solesmes), “The secret of joy, of security in the supernatural life, is to center one’s attention upon God rather than on oneself.” To love God, therefore, is “complete and total joy, for God is immutably happy” (Dom Paul Delatte). This is the goal of our monastic life.